Besides being influenced by the music of London in the “Swinging 60’s”, Northampton based Ginger Pig Band has had a long term connection with New Orleans. They have played and toured with a host of jazz greats including, to name just a few, Kid Thomas Valentine, Tuba Fats, Sammy Rimington, Ken Colyer, John Crocker and Pat Halcox. They have also toured widely in Europe – for instance to Belgium, Denmark, Holland, Germany and Switzerland. 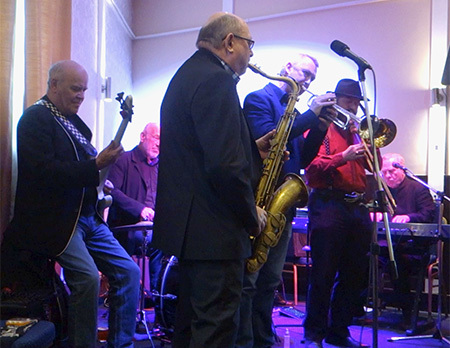 So even though it is virtually on the band’s doorstep, fans packed the Walnut Tree, Blisworth, on Sunday, 4th February, for a full on session of Ginger Pig Jazz, along with special guest Mike Owen on trombone. Here is a selection of Jazz&Jazz YouTubes filmed on the day. “Its hard to play that slowly…good job guys! 🎶🎵🎺” (Bob Kemper). Be sure to visit: Introducing Florence Olivia!